David M. Cannell & Associates have long history of combining our detailed knowledge of vessel operations and requirements with our technical expertise and creativity to find original solutions, and develop these into working designs. 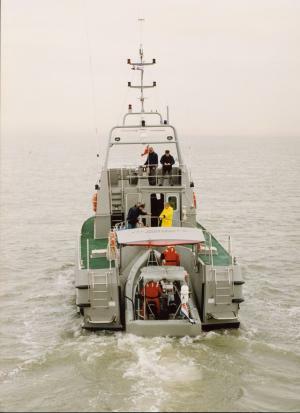 Examples of this include the ‘Fast Round Chine Vessel’ hull form used for many of our fast commercial vessel designs, and the Daughter Vessel launch and recovery system used on a number of our Patrol and Coastguard vessels. "FRCV" (Fast Round Chine Vessel) is a hull form concept developed by David M. Cannell & Associates, and currently in use around the world as fast patrol boats, pilot boats and even motor yachts. These vessels are designed to bridge the gap between fully planing and displacement vessels, combining many of the best characteristics of both types. The FRCV hull form is sea kindly and exceptionally stable in roll, with the ability to keep decks dry in conditions when a conventional displacement or semi-displacement vessel would be hampered by restricted visibility due to spray on the forward screens. The form is very versatile, having been tested in variants from 12m to 30m length, at top speeds from 20 to almost 40 knots, and with power provided by twin conventional propellers or by twin waterjets. 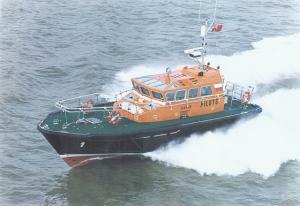 Many commercial vessel operations, including search and rescue, customs and fisheries patrol, require the use of a RIB ‘daughter’ vessel. Launching and recovery of a RIB can be a hazardous operation using traditional davit or crane launching and recovery methods. The stern launch and recovery system developed by David M. Cannell & Associates allows the RIB to be launched in a matter of seconds in sea conditions up to Sea State 5 and recovered simply and safely in the same conditions. The system is in use on a number of David M. Cannell & Associates’ designs worldwide, including the 26.5m USCG Coastal Patrol Vessel class, and the 23.5m FRCV class, as used by Eastern Sea Fisheries in the UK, and by the Royal Gibraltar Police.